DENVER, Nov. 29, 2018 /PRNewswire/ -- Lockheed Martin (NYSE:LMT) will apply its expertise in interplanetary spacecraft to a new program designed to deliver commercial payloads to the surface of the Moon. NASA announced today they have selected Lockheed Martin's McCandless Lunar Lander to provide payload delivery services as part of the agency's Commercial Lunar Payload Services (CLPS) contract. Lockheed Martin's lander design builds on four decades of experience engineering deep space missions, including Mars landers. The McCandless Lunar Lander is based on the proven design of the InSight lander – which just touched down on the Martian surface on Monday, Nov. 26 – and the Phoenix lander – which successfully arrived at Mars in May 2008. "We are excited to leverage our interplanetary lander designs and experience to help NASA build a new economy on and around the Moon, and beyond," said Lisa Callahan, vice president and general manager for Commercial Civil Space at Lockheed Martin. "Lockheed Martin has built more interplanetary spacecraft than all other U.S. companies combined, including four successful Mars landers. With our expertise on Orion and the NextSTEP lunar habitat, we can maximize the value of CLPS for lunar science operations as well as the path forward to tomorrow's reusable human lander." The McCandless Lunar Lander is capable of transporting large payloads weighing hundreds of kilograms – including stationary scientific instruments, deployable rovers, or even sample return vehicles – to the surface of the Moon. The lander uses a proven propulsive landing approach that relies upon on-board radars and a set of rocket thrusters firing 10 times a second to slow to just five mph before touching down. 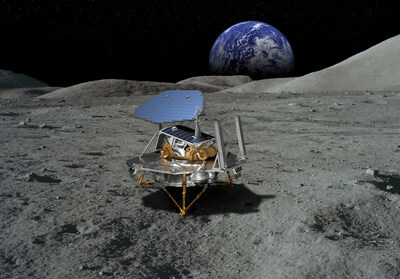 Once on the lunar surface, the lander can provide power, communications and thermal management for sophisticated payloads. "We're no stranger to commercial space business models, having built more than 100 commercial satellites and launched numerous Atlas and Titan commercial payloads," said Callahan. "On our last 10 interplanetary missions for NASA, we delivered on or ahead of schedule, and on budget. We want to assure payload customers who select Lockheed Martin can be confident that we'll deliver on-time and on-budget." The McCandless Lunar Lander is named in honor of the late Bruce McCandless, a NASA astronaut and longtime Lockheed Martin employee who was a pioneer in space exploration. McCandless is best known for conducting the first ever untethered spacewalk using the Lockheed Martin-built Manned Maneuvering Unit during a flight on the space shuttle. He originally joined the astronaut corps during the Apollo program and served as the voice of mission control for Neil Armstrong's famous moonwalk. After retiring from NASA he was instrumental in the design of exploration technology and training the next generation of planetary explorers during his tenure at Lockheed Martin.